Not too long ago, I remember reading online about bacon pancakes. They consisted of strips of cooked bacon with pancake batter poured over them. They cooked up and when finished, each pancake had a strip of bacon down the middle. It looked pretty intriguing but not as appetizing as I thought it could be. Taking the same idea of having bacon and pancake batter come together, I made a simple buttermilk pancake recipe, poured a little into my hot skillet and sprinkled crumbled cooked bacon over the top. Once it was flipped and cooked to perfection, I was left with a fluffy pancake speckled with bits of crunchy salty bacon. If you add some pure maple syrup and a pat of butter to these pancakes, it's quite a breakfast to start any day! The pancakes could also be made in advance and frozen. To prepare, just toast it in a toaster or pop it in a microwave for a few seconds until warmed through. If bacon is not your thing (who doesn't love bacon?! 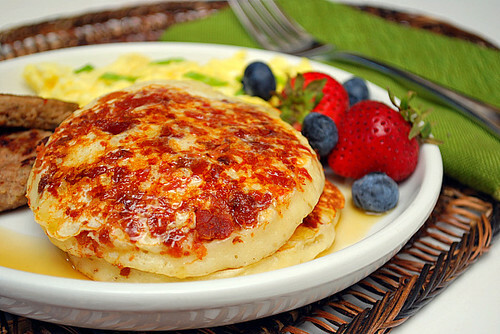 ), you can use the pancake recipe and substitute the bacon with crumbled breakfast sausage. Not into the whole meat and pancake combo? No worries! Throw in your favorite fruit like sliced strawberries, blueberries or even raspberries. Heck, you could even throw in chocolate chips and nuts! In a large bowl, whisk together the flour, sugar, salt, baking powder, and baking soda; make a well in the center of this mixture and set aside. In a 2 cup measuring cup, whisk together the buttermilk, sour cream, eggs and melted butter. Pour this buttermilk mixture into the well of the dry ingredients. Gently stir until just combined. You'll want a slightly lumpy batter - don't over mix. Let the batter rest for 10 minutes before cooking. In a 12 inch non stick skillet over medium heat, apply a thin coating of cooking spray and allow the pan to get hot. Using a 1/4 cup measuring cup, scoop up the rested batter and carefully pour the batter into the pan. You should be able to fit 4 pancakes in the skillet. Sprinkle some crumbled cooked bacon into the pancake tops. Cook until the top of the pancakes begin to bubble, the edges are set and the bottom is a nice golden brown. Flip the pancakes with a wide spatula and continue to cook until the second side if golden brown. Spray the pan as needed and repeat with the remaining batter. Serve pancakes with your preferred syrup and butter. Putting bacon right inside the pancakes? That's like magic! I've seen chocolate-covered bacon for sale at the Canadian National Exhibition. Does that mean chocolate chip and bacon pancakes are a possibility? Yes, these pancakes are workin for me. They look spectacular! Pancakes and bacon is a match made in heaven !!! I'll bet these are SOOOOOO good! Can't wait to try them!